Intense solar flares release very-high-energy particles that can be as injurious to humans as the low-energy radiation from nuclear blasts. Earth's atmosphere and magnetosphere allow adequate protection for us on the ground, but astronauts in space are subject to potentially lethal dosages of radiation. The penetration of high-energy particles into living cells, measured as radiation dose, leads to chromosome damage and, potentially, cancer. Large doses can be fatal immediately. Solar protons with energies greater than 30 MeV are particularly hazardous. In October 1989, the Sun produced enough energetic particles that an astronaut on the Moon, wearing only a space suit and caught out in the brunt of the storm, would probably have died. Many communication systems utilize the ionosphere to reflect radio signals over long distances. Ionospheric storms can affect radio communication at all latitudes. Some radio frequencies are absorbed and others are reflected, leading to rapidly fluctuating signals and unexpected propagation paths. TV and commercial radio stations are little affected by solar activity, but ground-to-air, ship-to-shore, Voice of America, Radio Free Europe, and amateur radio are frequently disrupted. Radio operators using high frequencies rely upon solar and geomagnetic alerts to keep their communication circuits up and running. 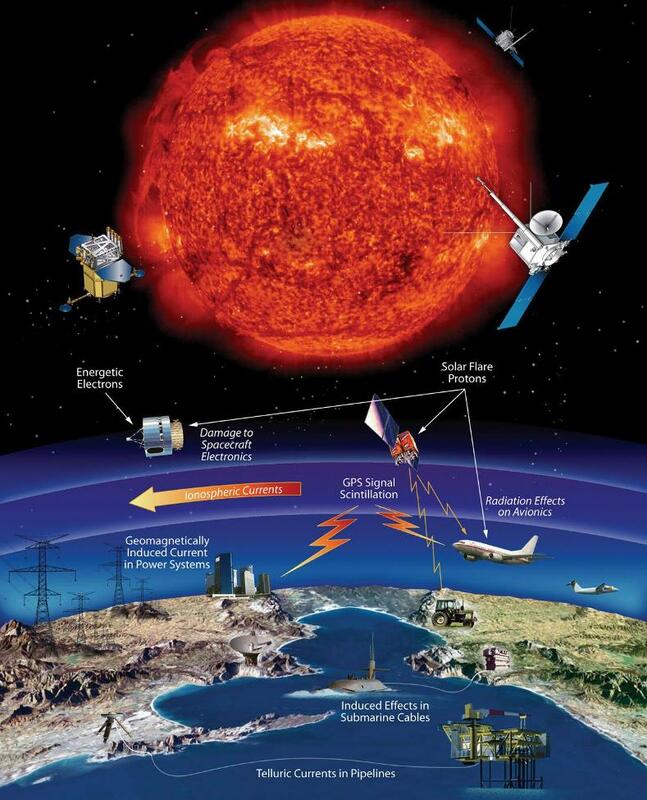 Some military detection or early-warning systems are also affected by solar activity. The Over-the-Horizon Radar bounces signals off the ionosphere in order to monitor the launch of aircraft and missiles from long distances. During geomagnetic storms, this system can be severely hampered by radio clutter. Some submarine detection systems use the magnetic signatures of submarines as one input to their locating schemes. Geomagnetic storms can mask and distort these signals. 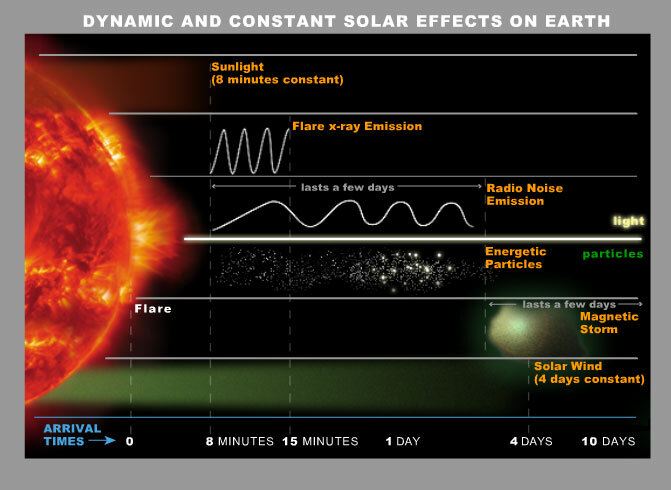 Solar flares can also doom satellites. Reaching the earth in just eight minutes, their powerful UV and X rays help heat up and expand the atmosphere, thereby increasing molecular drag on low-orbiting satellites and shortening their orbital life. Another problem for satellites differential charging. 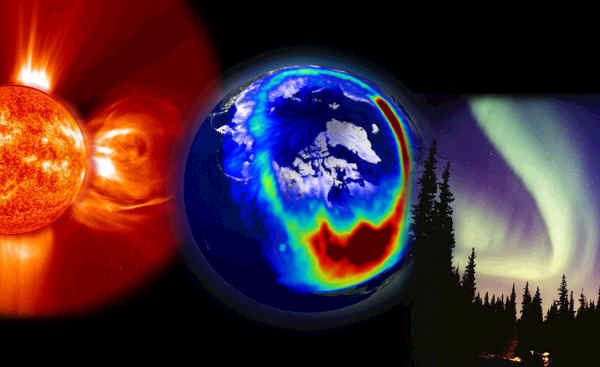 During geomagnetic storms, the number and energy of electrons and ions increase. When a satellite travels through this energized environment, the charged particles striking the spacecraft cause different portions of the spacecraft to be differentially charged. Eventually, electrical discharges can arc across spacecraft components, harming and possibly disabling them. 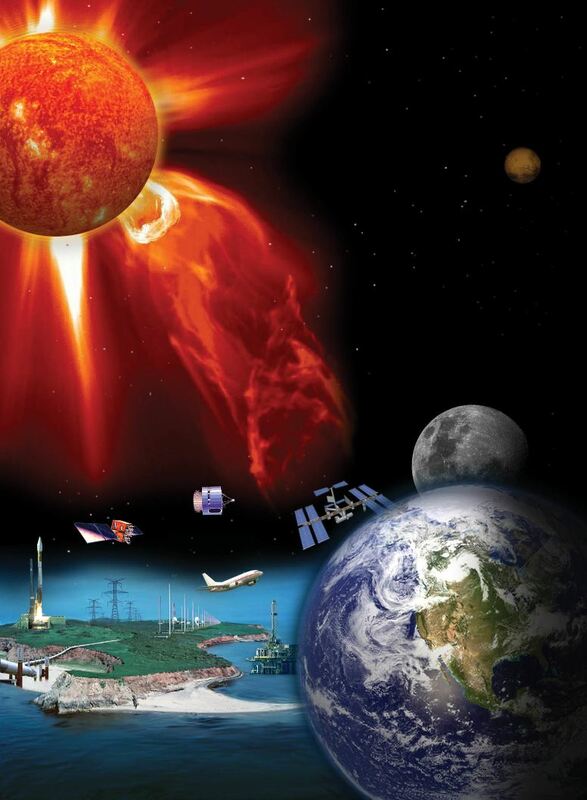 Bulk charging (also called deep charging) occurs when energetic particles, primarily electrons, penetrate the outer covering of a satellite and deposit their charge in its internal parts. If sufficient charge accumulates in any one component, it may attempt to neutralize by discharging to other components. This discharge is potentially hazardous to the satellite's electronic systems. When magnetic fields move about in the vicinity of a conductor such as a wire, an electric current is induced into the conductor. This happens on a grand scale during geomagnetic storms. Power companies transmit alternating current to their customers via long transmission lines. The nearly direct currents induced in these lines from geomagnetic storms are harmful to electrical transmission equipment. Rapidly fluctuating geomagnetic fields can induce currents into pipelines. 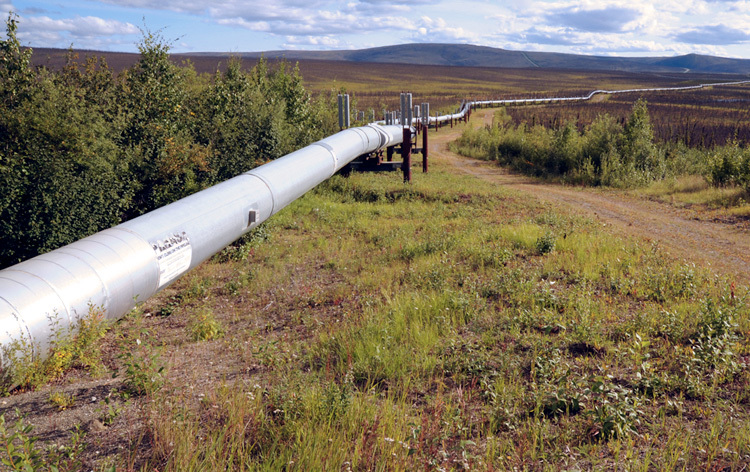 During these times, several problems can arise for pipeline engineers. Flow meters in the pipeline can transmit erroneous flow information, and the corrosion rate of the pipeline is dramatically in creased. If engineers unwittingly attempt to balance the current during a geomagnetic storm, corrosion rates may increase even more. Pipeline managers routinely receive alerts and warnings to help them provide an efficient and long-lived system. Auroras most often glow green, the color emitted by oxygen atoms high in the upper atmosphere after they are struck by bombarding electrons from Earth's magnetosphere. Red displays are rarer, sometimes involving energized nitrogen molecules lower down in the atmosphere -- an indication of a more potent geomagnetic storm. Auroras that extend away from the poles and closer to the equator also reflect strong storm conditions. The Northern Lights/Southern Lights, or Aurora Borealis, is natures own gigantic light-show. An Aurora Borealis occurs when the particles from the sun are being thrown against the earth by the solar wind. When the particles collide with the earths atmosphere, the energy of the particles are turned into light.